Redesigning a kitchen from scratch is one of the most ambitious and important of home improvements you can make, and getting its style just right so that it fits with your property's period and your interior decor is vital. So, if you're wondering how to design a kitchen for a period property, whether you want an authentic or contemporary look, start here, with our comprehensive guide. For more inspiration and expert advice, take a look at our ultimate guide to planning, designing and furnishing your kitchen. Where to start designing a kitchen for an old home? Before you start thinking about how to design a kitchen for a period property, you'll want to take a good look at your existing kitchen. Carefully consider how you use the space and how everything is organised. As well as thinking about what you’d like to improve, take time to consider your kitchen's positive points – is there anything you're like to keep or upcycle? Once you've thought this through, pull together all your ideas (this can include collected images) to create a wishlist. Include in your wishlist big things, such as an open plan space or a central kitchen island, as well as smaller elements, such as smart cabinet interior fittings, more power points or a Belfast sink. Once you have figured out how your kitchen should function and the features you’d like, you can begin to work out how big of a change you need to make to achieve it. If you don’t have the space for everything you want, or certain individual items are impractical or pricey it may be worth consulting a kitchen designer who can help you work out where you can compromise. We've put together a list of what to ask a kitchen designer which will make this process easier for you. Which kitchen style for a period home? When making your wishlist, start building a mood board (online or in a notebook) of the overall feeling you want to create. There is an art to creating a kitchen that marries modern functionality with period looks. Many period homeowners don’t even try, and instead prefer an honest approach – mixing contemporary minimalist cabinetry with a rustic shell. ‘If you have wooden beams on show, teaming these with solid wood worktops effortlessly pulls the kitchen and room themes together,’ continues Tori. To further highlight beams, use pale cupboard shades, which will lift the whole scheme. Now is also the time to consider whether you need to replace existing kitchen cabinetry, or if it could simply use a refresh. Our guide to how to paint kitchen cabinets talks you through the steps, should you decide on the latter. Bespoke or off the shelf kitchen cabinetry? A kitchen comprised of handmade solid hardwood in-frame cabinets – which are made using traditional jointing techniques and have doors that sit within a frame – is the ultimate type for most period homes. Not only do they look the part but they can be tailor made for awkward spaces and wonky walls, and their design can take their cue from original features already in the property. The cabinets may be treated to reveal their natural wood finish or are painted in any colour, and be fitted or, in keeping with more traditional style, freestanding. You cannot fully recreate the look of an in-frame kitchen with off-the-shelf flatpack cabinets – which have doors mounted on to the front using hinges screwed into the chipboard – but you can still create a classic design, using solid wood or Shaker-style moulded door fronts and décor panels, as well as other decorative elements. The units generally come in a choice of standard sizes and configurations, with filler panels or areas of open shelving making up gaps when the sizing doesn’t perfectly fit the space. Our guide to choosing an English kitchen talks you through some of the best options available for period homes. Once upon a time, the ‘work triangle’ – where the sink, hob and fridge are evenly sited at key points around the cook in the centre – was the main factor when designing a kitchen layout. While this theory is still useful, it was developed when cooking was a solitary task and kitchens were smaller, and doesn’t take into account how home life has evolved. Nowadays, an open plan kitchen-diner is generally considered better suited to modern living. It's likely an open-plan space will need to include extra seating or a play space, so the way the layout is planned has to be adapted, but with care in a period home so that the original bones of the house aren't compromised. Our guide to how to design an open plan kitchen is a useful read if you're keen to get a successfully cohesive, well-laid out room. You'll find plenty of inspiration in our guide to how to design a freestanding kitchen if you're looking for an unfitted finish, too. Good storage is a must-have for any kitchen, but in an old home or period property, you're going to have to make allowances for angles that might not be perfectly square or simply quirky – and this may mean having storage solutions created for you, rather than buying off-the-peg. Cramming units in wall to wall can make the space feel cramped. Instead, break up runs of wall units with open shelving, plate racks or at the very least use glass-fronted cabinets for display pieces. Choosing a larder over a conventional unit can be a great way to make the most of a smaller kitchen, with a built in design able to store more than you might expect. Fitting a larder unit, or other tall cupboard, and an American fridge-freezer side by side to form a wall of storage can help free up valuable space in the working part of the kitchen. This also avoids too many long runs of cupboards. ‘Internal cupboard storage is key to maximising space without detracting from the period feel on the outside,’ says Tori Summers from Benchmarx Kitchens and Joinery. ‘Integrated carousels, swing-out corner shelves and pull-out larders are all excellent. You can also make the most of every inch with internal drawers, pull-out wire shelves and storage baskets. Details such as worktops, tiles, sinks and taps are often the first things people notice in a kitchen and can make all the difference to the overall design. This makes choosing them an important part of the process of designing a kitchen for a period property. A kitchen worktop needs to be durable and practical as well as good-looking. Solid wood and granite are the most popular options for period homes, and can beautifully complement each other when used together – for example, a granite island and wood everywhere else. For advice on the best types of kitchen worktop, browse our feature, it covers everything from granite, quartz and marble to laminate, glass and wood. You can find plenty of clever kitchen design ideas, too. The cost of tiles can vary hugely depending on whether you are going for a stylish but simple option, such as a metro design, or characterful handmade tiles. If you're looking to cut costs, remember that you don’t have to fill every wall with tiles, and can instead opt for a statement design over the cooker, for example, and use worktop upstands elsewhere. For tips on how to choose the best kitchen tiles, take a look at our specialist guide. You'll find plenty of inspiration for beautiful ways to use metro tiles, as well as kitchen splashback ideas in our kitchen design features too. A Belfast or butler sink is the classic choice for a period home. Reclaimed versions are highly prized, but will need some TLC before they can be fitted to remove stains. If you want to make more of a statement, opt for a rustic copper sink. We've put together a handy and informative guide to help you buy the best kitchen sink. Go on, give it a read. There is a wide choice when it comes to taps. Swan-neck designs are practical and lend classic elegance. Bridge taps are more ornate and work in more characterful schemes. Bib or pillar taps are less practical than mixer taps, but lend a simple, retro look. Don’t be afraid to add a modern twist to the kitchen with a striking contemporary design, perhaps a sleek shape in a warm rose gold finish. Finally, you'll want to make sure your kitchen appliances are in-keeping with the scheme. Range cookers are the real heart of the kitchen, and modern designs are more practical then their predecessors. When it comes to fridge-freezers, the best options are to hide them in cabinets or opt for a statement design, such as an American-style fridge-freezer, or a retro model. Our buying guide will help you buy the best kitchen and home appliances if you're in need of more guidance. Lighting can make or break the mood of the room, so it’s worth spending time researching fixtures, especially if you're looking to design a kitchen for a period property with specific requirements. Use our guide to the best kitchen lighting, along with the following tips and tricks to ensure you come up with the best solution. Introduce daylight from as many directions as possible, including rooflights. French, sliding or bi-fold doors that open onto the garden will also add to the light levels. Make sure you allow for enough lights during the ‘first fix’ electrics. Buy light fittings as early as possible, and keep boxes and receipts so you can take them back if necessary – it is difficult to judge what will work until you position it. If fitting recessed spotlights, ensure they do not puncture insulation or airtightness systems as this can create draughts. Recessed spotlights can be problematic in old buildings without enough space in the ceiling void. Ask an electrician for advice. Pick a variety of lights from task lights to light washes. Think if you’d like dimmable ones. Wire fixtures on different circuits so they can be switched on separately. Investigate low energy and LED lighting, which are more environmentally friendly and will save you money in the long run. How much does it cost to design a kitchen for a period property? 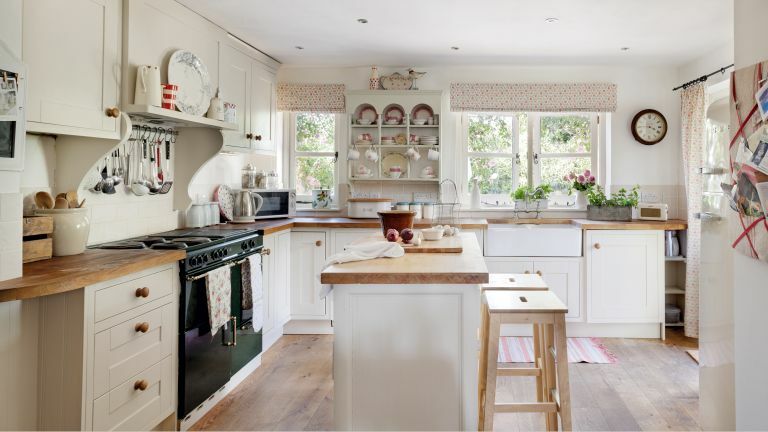 The cost to design a kitchen for a period property varies depending on the quality of the units, appliances and finishes, and how much work is entailed in the installation. As a rough guide though, you should look to spend between 3 to 5 per cent of the overall value of the house. Though highly desirable, handmade kitchens demand a premium, with prices tending to start at around £15,000 for furniture only. If you decide this is the option for you, you'll find plenty of inspiration in our handmade kitchen ideas. Some companies offer more affordable alternatives made of softwood, such as pine, which are still made in the same way but may not be as hardwearing. Prices start from around £4,000 for furniture only. It’s important to decide the maximum amount you are prepared to pay for your kitchen and make sure the supplier understands. Ensure you budget for appliances, installation, electrics and plumbing, as well as finishes such as tiles and worktops. If you are on a tight budget, there are a number of ways to save money that are perfect for creating a traditional look, such as upcycling, salvage yard finds or repurposing original cabinetry. Alternatively, if you don’t have the budget to change everything right now, there are a number of quick and easy kitchen updates that can transform your kitchen. For tips on innovative ways to cut the cost of your new kitchen, take a look at our feature. If you know exactly what you want you may be tempted to design the kitchen yourself, but you will likely end up happier with the finished space if you consult with an experienced professional. This is mostly because a good designer will think of solutions you may not have considered, spot potential issues and help you to get the most out of your budget. At the very least, take your wishlist and a plan of the room, showing dimensions, to a couple of kitchen showrooms and pick the brains of the designers there. Many retailers offer a free design service, but for a large-scale project, you should consider independent kitchen or interior designers, as they will be able to recommend different suppliers to get the exact finish you want and can project manage the work if required. Expect to pay in the region of £500–£1,000. Use our guide to what to ask your kitchen designer to find out more. If your current kitchen isn’t big enough to include all the elements you would like in the new design, consider extending sympathetically to gain more space. We have lots of inspiration in our ultimate guide to kitchen extensions feature. One of the most popular extension projects is to add a kitchen/dining/living area which opens out to the garden through wall-to-wall doors. Assuming they meet certain criteria (check the Planning Portal), such projects often do not require planning permission. Alternatively, you may be able to create a large open plan space by removing a non load-bearing wall between the kitchen and dining room. Discover everything you need to know about kitchen extensions in our specialist feature. We also have tips on permitted development rights for extensions and how to create an open plan layout in an old home, should you need them. Looking for more kitchen advice and inspiration?